Boxing Day is a 1-Vs.-3 Mic minigame in Mario Party 7. Its name is a pun on boxing as a sport and the holiday Boxing Day. The team of three stands on a large Bob-Omb painting while 16 "?" tiles cover it. Meanwhile, the camera pans out to reveal the rest of the arena (with Bob-Ombs in the stands) and the solo player, who is in a robot with two mechanical arms. The minigame then begins. The goal of the team of three is to dissolve the tiles by Ground Pounding them. On the other hand, the solo player's goal is to knock away the other three players using a robot with two large mechanical arms wearing boxing gloves. The single player has to command the machine to rotate, double punch, rocket punch, punch left, or punch right. If the solo player wins, he/she and the robot perform victory poses. If the team of three wins, the team stands on the now-revealed painting performing their victory poses while Bob-Ombs drop in on the solo player's robot and destroy it, after which various parts of it catch on fire due to electrical failures. 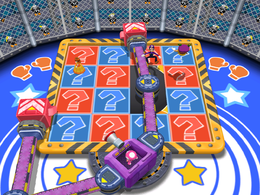 Mic – Say: "Right", "Left", "Double punch", "Rotate", "Rocket punch"
Rules – "One player uses the Mic to guide the robot arms, while the other players try to Ground Pound the tiles.'" Advice – "The robot must complete one full attack before you can give it another command." This page was last edited on May 22, 2017, at 17:09.